It took some period of time before the slots in modern meaning of a word were introduced to the gambling world and gained publicity. Foundation of the first slot apparatus called Liberty Bell took much strain from its founder and thus, father of his brainchild - Charles Fey. After the invention of the slots and also their improvement in fruitful cooperation with The Mills Company, Charles Fey was able to organize his own factory of slot machines manufacturing that could give him some profits. In fact the approved manufacture of the mechanisms became a basis of the capitalistic era in the USA and initiated the world wide recognition of Fey as an inventor and prosperous business owner. Over 30 000 such machines were produced on Fey's factory. In addition, the cast iron mechanisms era was ended in the year 1915, when the Mills Company introduced the variant of Fey's slots made of less expensive and lighter wooden cabinets. Furthermore, in 1930s under the Mills Novelty Company's supervision a great number of some additional transformations to the line of slots that managed to revolutionize the industry were conducted. The most important was a silent feature that was implemented at this time. Slots became quieter. Due to the current legislation Charles Fey had no appropriate opportunity to patent his own brainchild. Because of that he was made renting his machine to the local gambling establishment, saloons, pubs, etc. It was possible to charge only fifty % commission. In addition, Fey had to resort to using chewing gums or drinks rewards to avoid the problems with gambling laws that banned any gambling machines. 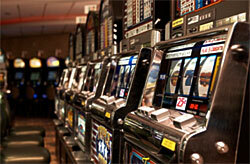 In addition, the operators encountered the slot machine cheats problems. With the flow of time the gamers learned the cheating methods. They particularly cheated with the help of the fake coins. Charles Fey in order to prevent cheating slots offered the first in the history detection pin that was designed to distinguish the fake coins from the real coins. In fact the machine turned out to provoke massive hits leading to the demand and supply problems, and gambling laws restrictions. The other huge companies were offering after Charles Fey's foundation of slots to purchase his author's rights for slots manufacturing of Liberty Bell. However, fey refused to sell. Eventually, the Mills Novelty Company could produce the copy of the invention and name it Operator bell that later was defined as the first prototype of the fruit slots. The single difference was that the later mechanism had 20 images in total displayed on each reel.